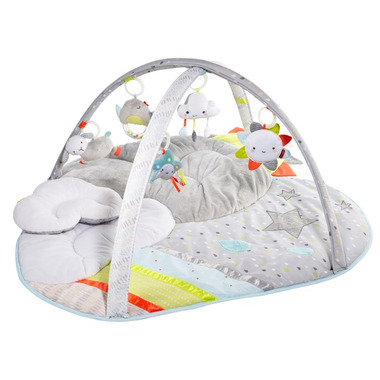 Skip Hop Silver Lining Cloud Activity Gym offers hours of plush playtime! It features a soft color palette to complement modern decor along with pops of bright colors to stimulate baby's sight. Five celestial-themed hanging toys will engage baby with lights, music and other stimuli while the cushy mat offers ultimate, cloud-like comfort. When it comes to baby's enjoyment, the sky's the limit! Great size, lots of room for my little one to play. Very soft. Wish the toys hung a bit lower though. Super cute, my little one really enjoys playing with it. Only suggestion would be if the toys hung a bit lower. I love this activity gym and so does my little one. We spend a good portion of the day playing on this. We do tummy time and then she rolls over to play with the rattles and suffed toys. There is one that plays music and another that flashes lights. She loves both. Plus the colours are beautiful and looks good with my decor. I highly recommend this gym. Lovely product. My baby just loves it. The light and sound doesn't play for very long but that doesn't really interest him. It's very soft and fuzzy too, which is excellent. wow! sooo beautiful! worth it!!!! shes loves it!